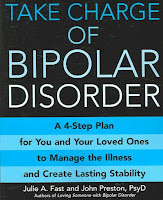 On Sunday, May 5, from 2:00 to 4:00 pm at the Cedar Mill Library, author Julie Fast will present a 4-step plan for managing bipolar disorder and creating a life of wellness. This free program will be held in the Cedar Mill Library’s upstairs community room. To reserve your seat, contact gayathri@myasha.org or the Cedar Mill Library's Adult Reference desk (503-644-0043 ext. 114). Julie Fast is a leading mental health expert on the topics of bipolar disorder, depression, seasonal affective disorder and mood management. She is the bestselling author of Loving Someone with Bipolar Disorder, Take Charge of Bipolar Disorder, and Get it Done When You’re Depressed. This event is sponsored by the Cedar Mill Community Library Association in conjunction with ASHA International, a Portland based non-profit organization dedicated to promoting personal, organizational and community wellness through mental health education, training, and support.